The Dragon’s Den curse… it is oft talked about, for the DD Crew have had all sorts of problems trying to do the sixth show of the series and even this one has a major flaw as Blake seems to keep disappearing down a well or something. In any case its done. Perhaps we’ll be able to get to 107 before Christmas… if not, er, Happy Christmas. They live! 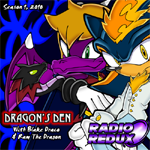 After several months of being absent the Dragon’s Den crew return, Blake Draco has a new headset, Ram The Dragon has a chip on her shoulder about missing Summer Of Sonic and apparently the whole show keeps getting haunted by a ghostly presence.